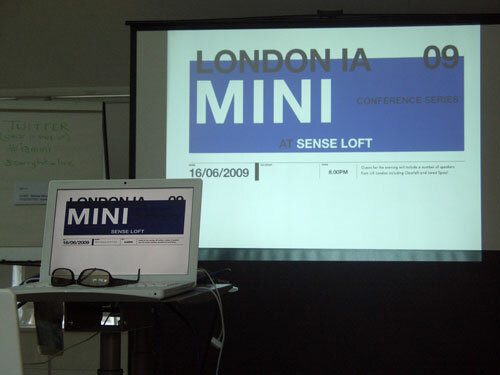 Yesterday I posted the first part of my notes, facts, and take-away quotes from the second 'London IA Mini Conference'. 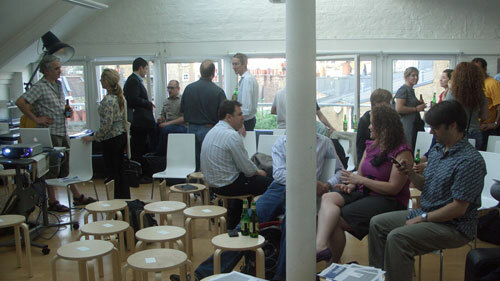 The event was held on one of the evenings during the UX London conference, and was hosted at the Sense Loft in Soho. That might seem like a negative quote but in the first talk of the second half, Angel Brown took on the brave task of explaining a highly refined concept to an audience who had already had a couple of beers. 'Actor Network Theory' was the topic, and I thought she did a tremendous job, explaining some really quite fine detail with enthusiasm. The theory had evolved from studies of 'how science got done'. This revealed that actually, rather than the rigourous application of experiments to theories, a lot of science 'got done' by being popular. The power relationships between scientists help determined what got peer-reviewed and published, and ideas that didn't fit the current paradigm struggled to gain acceptance, even if they could be demonstrated to a high level of proof. What was drawn out of this was the point that very often projects fail because the motivations, actions and capabilities of every 'actor' in the 'network' have not been accounted for sufficiently. Indeed, often we even fail to identify all of the actors. In web design projects without proper structure, it is easy to overlook crucial components like the upgrade cycle of the under-lying OS, the sleep patterns of the sysadmin, and the time pressure that content creators are under. Angel cited a famous case study to do with a project trying to preserve a scallop population. Long words like 'problematisation' and 'interessement' were used to describe the phases by which a problem is identified, a solution proposed, and then the 'owners' of that solution try to dictate terms to the rest of the actors in a network. The brilliant thing about this case study from a UX point of view was that it had the equivalent of the moment when the client says "yes, very good work, but despite all the evidence suggesting blue is better, we'll have it in red please'". In the scallop project, that moment came at Christmas when the local fisherman got drunk and over-fished the bay, decimating the population the scientists had spent months trying to protect. Although talking about a hi-fi environment, the pressure of delivering working applications to call centres, Ian Fenn adopted the admirably lo-fi approach of talking without slides using index cards. This task was made extra hard as it was by now getting very dark in the Sense Loft, and I'm not sure how he managed to read his own writing. Ian's belief is that once we have totally optimised an online customer self-service system, the call centre will increasingly end up only dealing with difficult problems. That means operators need a wide range of information at their finger-tips. Users are likely to already be having a bad customer experience, and anything that can improve that experience will be valuable to a brand's reputation. This included playing fake computer noises down the line to reassure the caller that 'something is happening', rather than having dead air as systems process information. Ian made some really great points. One of which was that we are often taught that on the web we can make mistakes, observe results and correct things. He suggested that when an application was deployed to a call centre, every misplaced click cost money. Multiply that by thousands of calls being routed through hundreds of staff, and you had the recipe for an economic usability nightmare. Getting it right first time can be daunting. Ian explained that very often he is delivering an application that is going to replace a sheet of A4 paper. As he said, that application has to be pretty damn good if the A4 paper isn't going to make a swift return. In a business context, he thinks any project where interface mistakes have to be 'trained around' has failed. Building for the expert but supporting the novice is the opposite of the approach we usually take to web application design, but the one that Ian Fenn endorsed for getting business critical internal systems right in call centres. 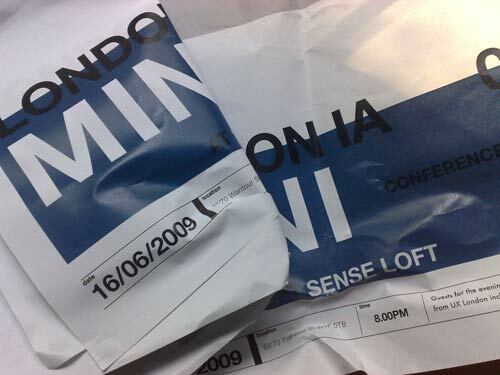 You can have a browse through the live tweeting of the event on the night - #iamini. I covered it using my @currybet_live account, and there was also commentary from @anditsin and @fstorr. We didn't get to report live on the whole event, as the Twitter downtime that was shifted to keep the system working in Iran occurred smack bang in the middle of the event. David Jarvis - "Top 5 conversion tips for travel E-Commerce websites"
Jason Mesut - "Ego vs. 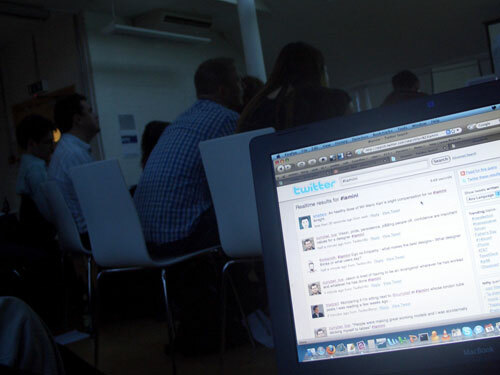 Empathy - the challenges of a UX designer"
The London IA group on Ning is in the process of organising the next London IA Mini event. At the moment this seems likely to take the form of a redux session of the UX London event, and take place some time in July. Well, at least according to this tweet from @solle anyway! By Martin Belam on 23 June 2009.